A nail gun, nailgun or nailer is a type of tool used to drive nails into wood or some other kind of material. It is usually driven by compressed air (pneumatic), electromagnetism, highly flammable gases such as butane or propane, or, for powder-actuated tools, a small explosive charge. Nail guns have in many ways replaced hammers as tools of choice among builders. The first nail gun used air pressure and was introduced to the market in 1950 to speed the construction of housing floor sheathing and sub-floors. With the original nail gun, the operator used it while standing and could nail 40-60 nails a minute. It had a capacity of 400-600 nails. Nail guns use fasteners mounted in long clips (similar to a stick of staples) or collated in a paper or plastic carrier, depending on the design of the nailgun. Some full head nail guns, especially those used for pallet making and roofing, use long plastic or wire collated coils. Some strip nailers use a clipped head so the nails can be closer together, which allows less frequent reloading. Clip head nails are sometimes banned by state or local building codes. Full Round Head nails and ring shank nails provide greater resistance to pull out. Nailers may also be of the 'coil' type where the fasteners come in wire or plastic collation, to be used with nail guns with a drum magazine; the advantage is many more fasteners per load, but at the expense of extra weight. Industrial nailers designed for use against steel or concrete may have a self-loading action for the explosive caps, but most need nails to be loaded by hand. Nail guns vary in the length and gauge (thickness) of nails they can drive. The smallest size of fasteners are normally 23 gauge (0.025 inches in diameter), commonly called "pin nailers" and generally having no head. They are used for attaching everything from beadings, mouldings and so forth to furniture all the way up to medium-sized (7 to 8 inch) baseboard, crown molding and casing. Lengths are normally in the range ⅜ to 1¼ in. (10 to 32 mm), although some industrial tool manufacturers supply up to 2 in. (50 mm). The 23 gauge micro pin is rapidly gaining ground as users find that it leaves a much smaller hole than brad nails, thereby eliminating the time normally taken to fill holes and presenting a far better looking finished product. The next sizes are 16 and 15 gauge (1.63 and 1.83 mm diameter). These are generally referred to as "finish nails". They come in lengths between ⅝ and 2½ in. (16 to 64 mm) and are used in the general fixing of much softwood and MDF trim work (such as baseboard/skirtings, architraves, etc.) where the holes will be filled and the work painted afterwards. The largest sizes of conventional collated fastenings are the clipped head and full head nails which are used in framing, fencing and other forms of structural and exterior work. These nails generally have a shank diameter of 0.11 to 0.13 in. (2.9 to 3.1 mm) although some manufacturers offer smaller diameter nails as well. General lengths are in the range 2 in to ​3 1⁄3 in (50 to 90 mm). Shank styles include plain, ring annular, twisted, etc. and a variety of materials and finishes are offered including plain steel, galvanized steel, sherardised steel, stainless steel, etc. depending on the pull-out resistance, corrosion resistance, etc. required for the given application. These sizes of fastenings are available in stick collated form (often 20° to 21° for full head, 28° to 34° for clipped head) or coil form (for use in pallet/roofing nailers) depending on the application. Full-head nails have greater pull-out resistance than clipped head nails and are mandated by code in many hurricane zones for structural framing. Another type of fastening commonly found in construction is the strap fastening which is roughly analogous to the large head clout nail. These are used in conjunction with a strap shot nailer (or positive placement nailer UK) to fix metalwork such as joist hangers, corner plates, strengthening straps, etc. to timber structures. They differ from conventional nailers in that the point of the fastening is not sheathed so it can be exactly positioned before firing the nail gun. Other specialist nailers are also available which can drive spikes up to 6¼ inches long, fix wood to steel, etc. A variation on the nail gun is the palm nailer, which is a lightweight handheld pneumatic nailer that straps to the hand. It is convenient for working in tight spaces where a conventional nailer will not fit and is flexible enough to drive either short nails into metal straps or six inch nails into timber. By repeated hammer action (of around 40 hits per second) the fastener is driven into the material by a more constant palm pressure (as opposed to a conventional nailgun which drives the nail against the inertia of the nailgun). In the United States, about 42,000 people every year go to emergency rooms with injuries from nail guns, according to the U.S. Centers for Disease Control (CDC). Forty percent of those injuries occur to consumers. Nail gun injuries tripled between 1991 and 2005. Foot and hand injuries are among the most common. The U.S. Consumer Product Safety Commission estimates that treating nail gun wounds costs at least $338 million per year nationally in emergency medical care, rehabilitation, and workers' compensation. Often personnel selling the tools know little about the dangers associated with their use or safety features that can prevent injuries. Injuries to the fingers, hands, and feet are among the three most common, but there are also injuries that involve other body areas such as arms and legs as well as internal organs. Some of these injuries are serious and some have resulted in death. All kinds of nail guns can be dangerous, so safety precautions similar to those for a firearm are usually recommended for their use. For safety, nail guns are designed to be used with the muzzle contacting the target. Unless specifically modified for the purpose, they are not effective as a projectile weapon. The most common firing mechanism is the dual-action contact-trip trigger, which requires that the manual trigger and nose contact element both be depressed for a nail to be discharged. The sequential-trip trigger, which is safer, requires the nose contact to be depressed before the manual trigger, rather than simultaneously with the trigger. Approximately 65% to 69% of injuries from contact-trip tools could be prevented through the use of a sequential-trip trigger, according to the CDC. There is recoil associated with the discharge of a nail from a nail gun. Contact triggers allow the gun to fire unintended nails if the nose hits the wood surface or a previously placed nail following recoil. Nailers with touch tip (contact) triggers are susceptible to this double firing. According to a 2002 engineering report from the Consumer Products Safety Commission (CPSC), the recoil and firing of the second nail occurs well before the trigger can be released. Acute injury rates are twice as high among users of tools with contact triggers. In September 2011 The Occupational Safety and Health Administration (OSHA) and the National Institute for Occupational Safety and Health (NIOSH) issued a nail gun safety guide that details practical steps to prevent injuries including use of tools with sequential triggers, training prior to use, and use of appropriate protective equipment such as eye protection. In June 2013, NIOSH released an instructional comic providing information on nail gun hazards and ways to use the device properly. Research aimed at reducing nail gun accidents among frame carpenters, among the heaviest users of nail guns, is ongoing. This is the most popular type of nail gun. It is powered from a compressed air supply. Direct drive or high velocity devices. This uses gas pressure acting directly on the nail to drive it. Indirect drive or low velocity devices. This uses gas pressure acting on a heavy piston which drives the nail. Indirect drive nailers are safer because they cannot launch a free-flying projectile even if tampered with or misused, and the lower velocity of the nails is less likely to cause explosive shattering of the work substrate. Either type can, with the right cartridge loads, be very powerful, driving a nail or other fastener into hard concrete, stone, rolled steelwork, etc., with ease. Powered by a gas (e.g. propane) and air explosion in a small cylinder; the piston pushes the nail directly and there are no rotating parts. In one type of electric nailgun, a rotating electric motor gradually compresses a powerful spring and suddenly releases it. Here a solenoid propels a metal piston, which has a long front rod which propels the nail. The solenoid tends to attract the piston or projectile towards the middle of the solenoid. If a series of solenoids is used (which makes the nailgun into a type of coilgun), to get more power, each solenoid must be switched off when the piston has reached the middle of the solenoid. In multi-solenoid coilguns a short burst of power from a big capacitor (one attached to each solenoid) comes at the right time to propel the piston or projectile. For more information see Coilguns for ferromagnetic projectiles. 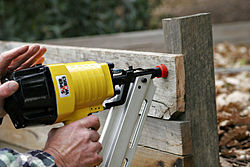 A pin nailer is a type of nail gun that releases pin-like fasteners. Unlike other nailers, the ‘nail’ used in such items do not have a flat head. They also have a small diameter so they can pretty much disappear into the surface while keeping pieces of wood together. Pin nailers are often used on molding for furniture, cabinets, and interior millwork. They can also work as temporary fasteners for pieces with irregular shapes that are impossible to hold down with a clamp securely. You can also use a pin nailer to secure to pieces of wood after gluing them together. In the 1989 movie Lethal Weapon 2, Roger Murtaugh kills two attackers with a nail gun. In the 2006 horror movie Final Destination 3, Erin Ulmer is killed by a nail gun shooting several nails into her head. In the 2006 spy thriller Casino Royale, the climactic fight in a sinking house has both an armed assailant and later James Bond shooting at each other with a pneumatic nail gun. In the movie, it is depicted as firing several nails per second, comparable to a submachine gun. In Season 4 of The Wire, a powder-actuated nail gun features prominently in the plot. In the 2014 movie The Equalizer, Nikolai Itchenko is killed by a nail gun shot by Robert McCall. Some nail guns are "cordless" and use a fuel and electric igniter to fire. In the nailgun's head, the inner chamber contains the piston assembly which drives the nail. Nails also come in coils. Accidental firing may lead to injury or death. ^ "M. Pynoos, 84; Civic Booster, Engineer". latimes. ^ "Spruce Goose nail gun designer dies". Daily Journal of Commerce. ^ "Nailing Machine Speeds Building". Popular Mechanics. 93 (3): 96. March 1950. ^ Lipscomb, Hester J.; Nolan, James; Patterson, Dennis; Fullen, Mark; Takacs, Brandon C.; Pompeii, Lisa A. (2011). "Buyer beware: Personnel selling nail guns know little about dangerous tools". American Journal of Industrial Medicine. 54 (8): 571–8. doi:10.1002/ajim.20954. PMID 21472746. ^ Jodati, A.; Safaei, N.; Toufan, M.; Kazemi, B. (2011). "A unique nail gun injury to the heart with a delayed presentation". Interactive CardioVascular and Thoracic Surgery. 13 (3): 363–365. doi:10.1510/icvts.2011.272120. ISSN 1569-9293. ^ Centers for Disease Control and Prevention (2007). "Nail-gun injuries treated in emergency departments--United States, 2001-2005". Morbidity and Mortality Weekly Report. 56 (14): 329–32. PMID 17431377. ^ Lipscomb, Hester J.; Nolan, James; Patterson, Dennis; Dement, John M. (2008). "Prevention of traumatic nail gun injuries in apprentice carpenters: Use of population-based measures to monitor intervention effectiveness". American Journal of Industrial Medicine. 51 (10): 719–27. doi:10.1002/ajim.20628. PMC 2574677. PMID 18704898. ^ CDC - NIOSH Publications and Products - Straight Talk About Nail Gun Safety NIOSH, June 2013. ^ "6 Best 23 Gauge Pin Nailer Reviews [2019 Updated]". ToolzFinder. 2019-04-15. Retrieved 2019-04-17. Wikimedia Commons has media related to Nail gun. Pritts, Timothy A; Knight, Douglas; Davis, Bradley R; Porembka, David; Cuschieri, Joseph (2005). "Accidental self-inflicted nail gun injury to the heart". Injury Extra. 36 (11): 517–9. doi:10.1016/j.injury.2005.05.003.